We wont be able to read the trabslations for spin off 4 until feburary. And volume 15 until maybe december. wow. looks like dust spinoff is really taking of. Vol 2 was somewhat disappointing but the 1st vol was incredibly funny, haven’t had THAT much fun reading a konosuba book since vol 6 of the main series. 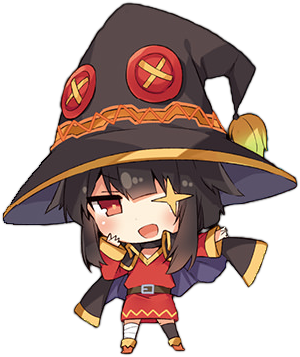 The main series is going a bit downhill since vol 10 so I’m looking forward more to the Dust spinoff, specially since Dust, aside from Kazuma, is my fav konosuba character. I feel like first Dust spinoff was too repetative. Dust wants money-Dust comes up with a plan-Dust fails-Dust wants money. Repeat until the end of the volume. Vol 2 was better. Unfortunately, Dust complains about money issues still even in the latest volume of the main series. If you ask me, I rather have had a spinoff of the other Japanese hero. At least that way, we could find out about the other Japanese heroes in KonoSuba because there are more than 2 Japanese in the KonoSuba world judging by how many Japanese were at that party at the castle in the capital.